Contents: 286 pages, 200 photographs. Recommendation: Highly Recommended for its original photographs - even better if you have German language skills! Eric Mombeek's latest volume is substantial in several ways. Weighing in at 286 pages, it is a big book. More importantly, with around 200 photos and detailed text it adds to our knowledge of these remarkable units. For those of us limited to the English tongue, the only disadvantage of this book is that it is solely presented in German. However, I found that I could apply my "pidgin German" (based mainly on technical jargon and common words) to easily interpret most captions. I would suggest that many Luftwaffe enthusiasts will have the same level of understanding. The book opens with a four-page supplement to Volume One. This includes 13 new images. 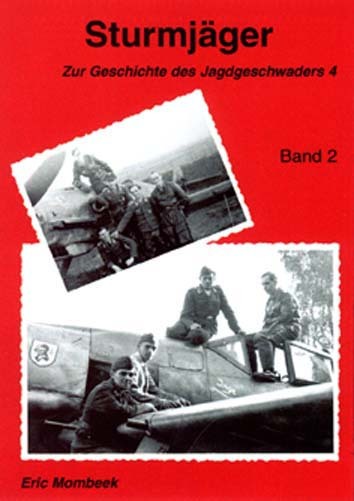 Volume Two proper begins with a chronological description of operations from September 1944 to "Das Bittere Ende". Description of these operations are largely drawn from directly quoted recollections and records, lending first-hand credibility to the text. Under these circumstances it is not surprising that the majority of photographs focus on the personnel of these units. Even so, the sheer bulk of picture coverage means that the modeller will not be disappointed. There is plenty of inspiration available from the subject aircraft, and the detail shots will be particularly useful. Also not surprisingly, the Focke-Wulf Fw 190A is best represented, with more than a smattering of Bf 109s and Fw 190Ds. The book is supported by several useful Appendices, including unit location maps on the Western and Eastern Fronts, a list of Jagdgeschwader, Gruppen and Staffel commanders of JG 4; and a comprehensive loss report. A kill list is also included, reflecting the dramatic downturn in activity from October 1944. Eric Mombeek's new book is an essential reference for all Luftwaffe historians and modellers with a serious interest in late-war fighter operations.